When I took a look at ASUS’ ROG SWIFT PG278Q G-SYNC (holy capital letters, Batman!) monitor back in November, I mentioned that having had experienced NVIDIA’s G-SYNC technology, I couldn’t imagine not having it. Nearly six months later, my opinion on that hasn’t changed. However, I have been wondering lately if I’ve outgrown 1440p. The natural choice would be to go 4K, but for me personally, I find that a little overwhelming (it’d be different if the monitor was 40-inches, but then it could be the physical size that’s overwhelming). 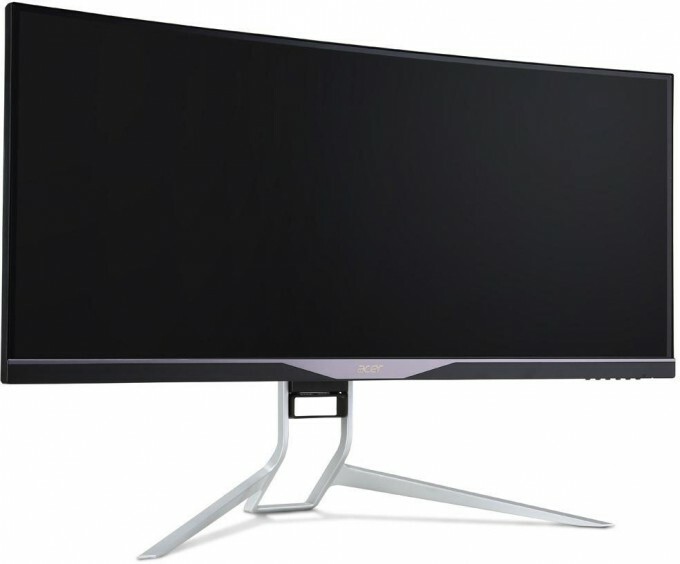 Without having ever used such a monitor, I’ve come to believe that a good compromise would be 3440×1440 – it’s almost as wide as 4K, but wouldn’t be quite as overwhelming thanks to its loss of 720 pixels in the height (4K is 8.3 megapixels; 3440×1440 is 5.5). But of course, one solution leads to another problem: such monitors don’t have G-SYNC. Well, that’s only true until Acer’s just-announced XR341CK drops. On paper, this looks to me like my personal “dream” monitor. I’ve already touched on the fact that it meets 1440p and 4K in the middle, and also that it includes G-SYNC, but the benefits extend beyond that. Coming in at 34-inches, it helps negate the huge resolution being overwhelming, and it also features an IPS panel (much like ASUS’ PG27AQ 4K). A 75Hz panel, at that. Oh, and in case it isn’t obvious enough from the stock shot, the XR341CK has another cool perk: it’s curved. Other features include a 4ms response time, a brightness of 300cd/m2, 8-bit color, 100% sRGB coverage, and dual 7W speakers. For ports, there’s 1x HDMI 1.4, 1x DisplayPort, and a USB 3.0 hub featuring four ports. I simply can’t find anything to complain about with the XR341CK. Its compromises are made in the right places, as far as I’m concerned, and all I know is that I want one. If there’s a major deterrent, it’s that this beaut will not come cheap: $1,299 USD. Still want one? You’ll have to wait until August. It looks to be worth the wait, though.